(Nanowerk Spotlight) Polymer composite films, particularly those based on polymers and layered nanomaterials, are attractive materials for exploiting the properties of multiple materials for applications in electronics and photonics. Recently, researchers have found that beta-lead oxide quantum dot (β-PbO QD)/polystyrene (PS) composite films exhibit excellent stability in high humidity and strong saturable absorption response from visible to the near-infrared (NIR) region. This makes them an attractive material for practical applications in optoelectronic devices in marine environments and other harsh condition, such as humid weather. 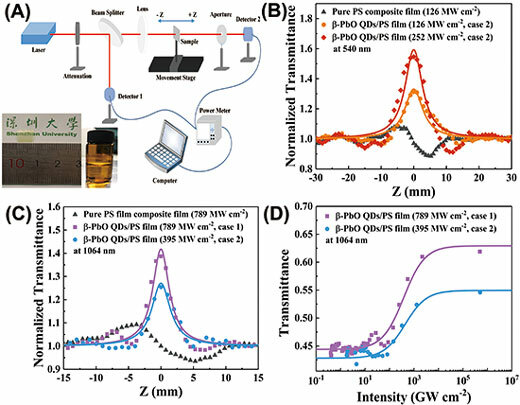 In a new study, led by Professor Han Zhang at Shenzhen University in China and published in Nanoscale ("Beta-Lead Oxide Quantum Dot (β-PbO QD)/Polystyrene (PS) Composite Films and Their Applications in Ultrafast Photonics"), the team reports the use of a flexible β-PbO QDs/PS composite film as saturable absorber device for typical mode-locked pulses generation at 1060 nm, even under water immersion. The β-PbO QDs were fabricated by liquid phase exfoliation and – through a solution blending method – were then well distributed within a β-PbO QDs/PS composite film with excellent transparency and flexibility. The inherent insolubility of both β-PbO QDs and PS provides the as-prepared β-PbO QDs/PS composite film with excellent water resistance (see inset in Fig. 1A). 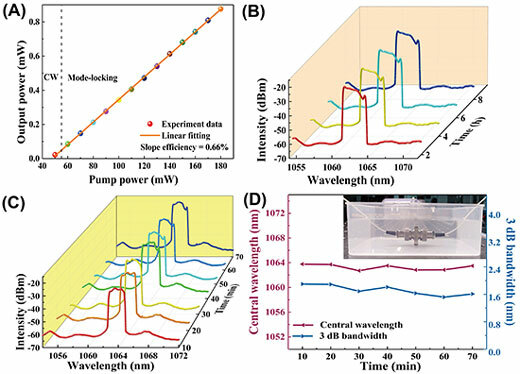 Notably, the homogeneous and highly transparent β-PbO QDs/PS composite film naturally decreases the non-saturable losses when the incident laser wavelength was comparable to the defect dimensions. As verified by the laser Z-scan technique, the β-PbO QDs/PS composite film, which was stored for more than three months or immersed in water for one day, showed a high capacity for optical modulation under excitation by a high-power laser beam at wavelengths from 540 nm to 1060 nm (see Fig. 1). The experimental data showed that the value of the nonlinear absorption coefficient of the β-PbO QDs was several orders of magnitude greater than those of previously reported nanomaterials, such as black phosphorus, black phosphorus QDs, MoS2 nanosheets, and MXene Ti3C2Tx. Besides, the saturable absorption intensity of the β-PbO QDs/PS composite film was close to that of MoS2 and lower than that of black phosphorus. The larger nonlinear absorption coefficient and lower saturation absorption intensity of β-PbO QDs suggest another potential application of this nonlinear optical material as a saturable absorber for visible and NIR wavelengths. 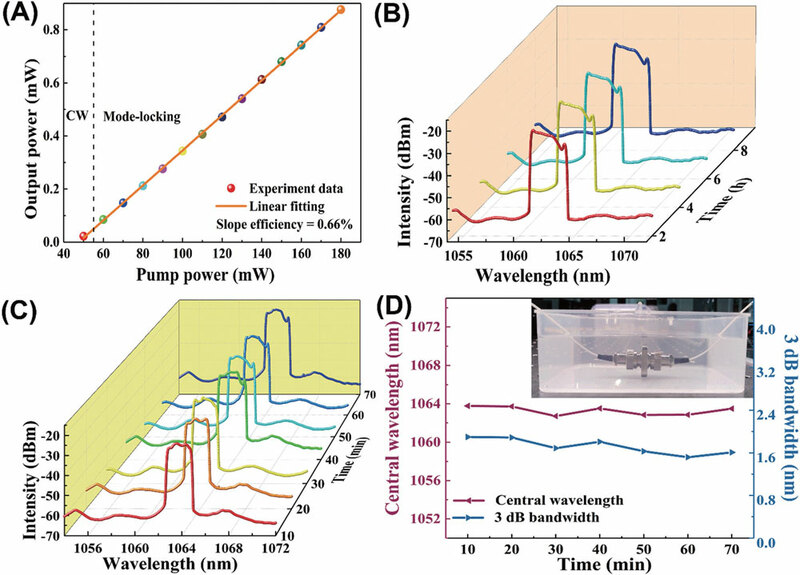 To further investigate the performance for mode locking, the researchers incorporated the β-PbO QDs/PS composite film-based saturable absorber into the ring cavity of an ytterbium-doped fiber laser (YDFL). They successfully achieved stable mode-locked pulses (see Fig. 2B) at a pump power of 55 mW, which is much lower than that of the mode-locking state in YDFLs based on other saturable absorbers, such as MoS2, Bi2Te3/PVA, MXene Ti3C2Tx, CH3NH3PbI3 perovskite nanosheets, and few-layer bismuthine, revealing that it was easier to obtain a mode-locking state without a high input power. The central wavelength of the spectrum was located at 1062.12 nm, with 3-dB bandwidth of 2 nm (see Fig. 2A). Fig. 2C showed a single pulse trace with a full width at half maximum of 303 ps. This resulted in a calculated time-bandwidth product of ∼161.16, suggesting that the mode-locked pulses were heavily chirped, which is also a characteristic of dissipative solitons. 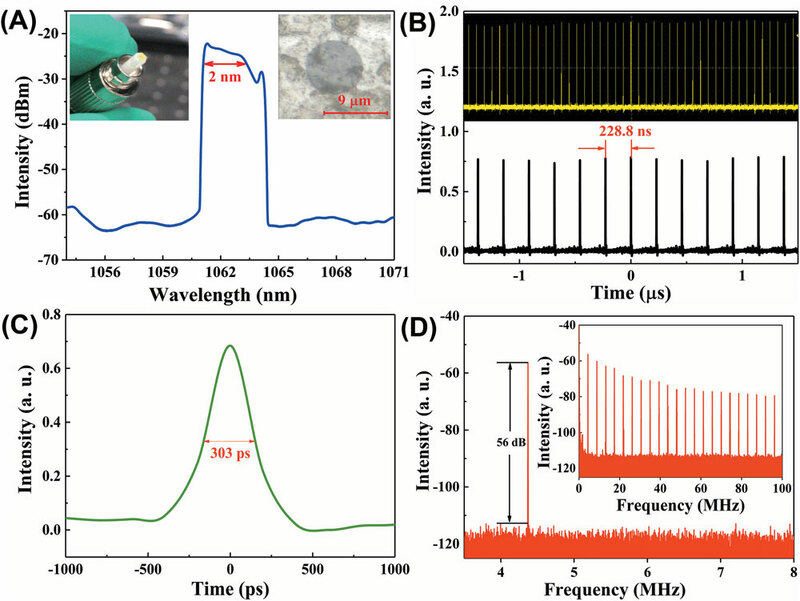 The fundamental repetition in the radio frequency spectrum was approximately 4.37 MHz with a high signal-to-noise ratio of up to 56 dB, further confirming the highly stable mode locking operation state of the fiber laser (see Fig. 2D). Furthermore, the damage threshold – when the optical power in the cavity is about 40 mW – of the β-PbO QDs/PS composite film saturable absorber is relatively high, which allowed the β-PbO QDs/PS composite film to be applied in situations involving strong light-matter interactions. To measure the stability of the films, the output spectrum was measured at 2-hour intervals at a pump power of 110 mW for 8 hours (see Fig. 3B), and no shifting or new wavelength components were observed. To further test the stability in harsh environments, the β-PbO QDs/PS composite film saturable absorber was immersed in room-temperature water (approximately 25°C; see the inset of Fig. 3D) for more than 70 minutes and the output spectrum was continuously monitored every 10 minutes under fixed experimental conditions (see Fig. 3C). The corresponding output spectrum changed slightly at the beginning but remained relatively stable in the subsequent period. The central wavelength drifted slightly from 1062.84 to 1063.78 nm, whereas the 3-dB bandwidth showed a slight perturbation from 1.52 to 1.9 nm (see Fig. 3D), confirming the water resistance and compatibility of the β-PbO QDs/PS composite film. In summary, the β-PbO QDs/PS composite film shows excellent performance as a saturable absorber for realizing a stable mode-locked Yb-doped fiber laser operation even under high humidity. 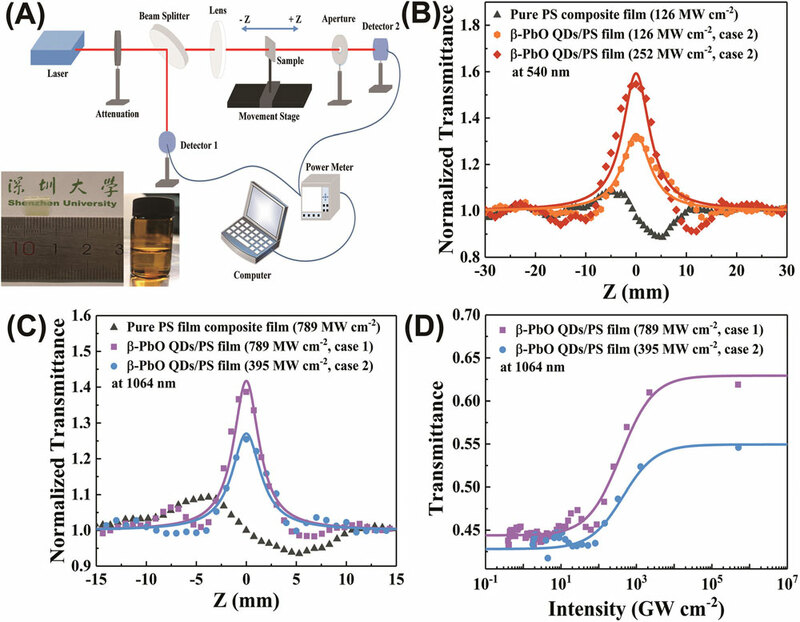 The researchers anticipate that this β-PbO QDs/PS composite film will benefit research into new waterproof, flexible photonic devices based on functional two-dimensional materials and polymers.